Mr Toily Kurbanov (Russian Federation) took up his appointment as the Deputy Executive Coordinator of the United Nations Volunteers (UNV) programme in August 2016. Mr Kurbanov spoke to UN Women during his official mission to Kenya and South Sudan about the importance of volunteerism and UNV’s contributions in addressing women’s issues. UNV is working together with UN Women and Peacebuilding Support Office (PBSO) in organizing workshops on gender-responsive peacebuilding in conflict-afflicted areas. 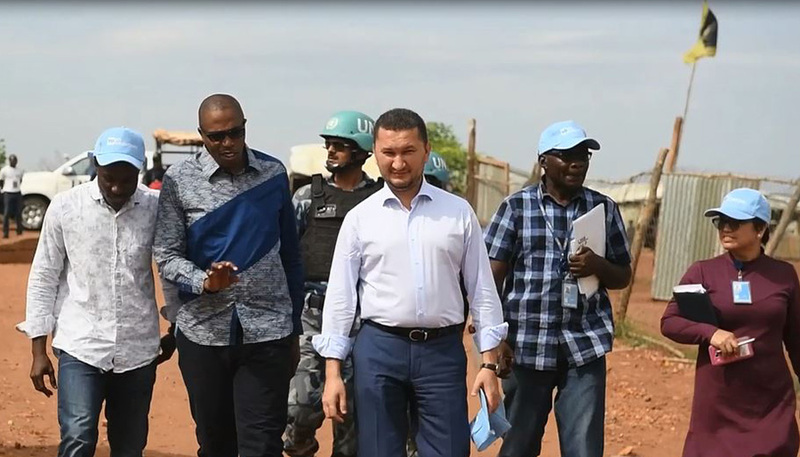 UNV Deputy Executive Coordinator Toily Kurbanov visiting a UNMISS Protection of Civilians site in Juba, South Sudan. How do you see the partnership between UN Women and UN Volunteers and why is this important? Ending all forms of discrimination against women and girls is a basic human right. It is also vital to accelerate sustainable development. It has been proven that empowering women and girls has a multiplier effect, and helps increase economic growth and development across the board. That is why, to contribute to equality for all genders, UNV has mobilized and continues to mobilize hundreds of highly capable, driven and passionate volunteers to support UN Women’s work at country level across all continents. How is UNV mainstreaming gender and addressing issues of women and SGBV (sexual and gender-based violence) especially in post-conflict situations? Because many UN Volunteers work at community level, they can genuinely improve social mobilization, advocate for women’s equal involvement in local development and decision-making, and encourage societal transformation. In Pakistan, for example, a UN Volunteer has helped women gain confidence, team spirit and leadership skills by promoting sports for women and girls, and, for example, organizing football matches. In Guatemala, UNV is working to empower adolescent girls by raising awareness among adolescents, their families and local authorities on women’s rights, and addressing issues such as early marriage, sexuality and violence against women. As SGBV has been proven to be most prevalent in post-conflict situations, UNV has organized workshops on gender-responsive peacebuilding in cooperation with Peacebuilding Support Office (PBSO) and UN Women. These workshops have trained UN Volunteers in gender-sensitive peacebuilding which they will utilize in their various assignments. What is the importance of volunteerism in achieving the SDGs? Engaging volunteers always means engaging people – and we cannot achieve the SDGs without bringing together people from all levels at all times. Through engaging a wide array of people, volunteerism strengthens civic engagement, contributes to social inclusion, deepens solidarity, strengthens local ownership of sustainable development, and helps to ensure that no one is left behind. What motivates you to keep working with volunteers? Thousands of people leave their homes, families and, often, countries in order to help humanity as UN Volunteers. Their confidence in the United Nations, their hopes for a better and a more peaceful world and their selflessness is what motivates me the most. My job, and that of my colleagues, is to create as much an enabling environment for UN Volunteers as we possibly can. We cannot let them down. Most of the volunteers are youth. How is UNV working with governments and other stakeholders to curb the ever-rising unemployment rates among youth especially in Sub-Saharan Africa? UN volunteers come from all age groups: some of them are young, some are mid-career professionals, and many others want to make meaningful development impact upon retirement. Average age of a UN Volunteer is 38 years. Yet, it is true that in Sub-Saharan Africa we have a higher ratio of young volunteers. Engaging young people – who might otherwise be unemployed – in volunteerism can give them confidence, passion, and a sense of purpose. Further, it supports them in developing vital skills and gaining experience, which will help them ease their way into the job market. Just to give one example, UNV supports the COMESA internship and volunteer scheme, for example. The scheme will run in all member states and plans to deploy 9,600 interns and volunteers. This interview was originally published on UN Women's regional website for Africa.